Sources of The BibleFor centuries, they have been saying that Muhammad(P) composed the Qur'ân by borrowing the Judeo-Christian material. 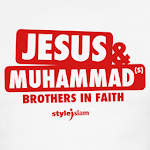 The 'logic' of showing the borrowing was to simply show similarity between the Qur'ânic and Biblical narrative and then conclude that Muhammad(P) copied the verses in question from the Judeo-Christian sources. So we figured that it was about time that we reciprocated the favour and pay the Christian missionaries their due in full. We will use their own methodology to show how good the Bible stands the scrutiny.